“I know Digi is a bacteria spread usually by animals that are brought into the farm. They say it shows up when the cows immune system is low. Is it just coming from the cows’ feet as in an infected cow walking in slurry? Or does she spread it by her own manure? I read somewhere that they found the bacteria in a cow. Maybe I am reading too much of the wrong stuff. Will the bacteria always be in a yard, even if you sell everything and start again? The bacteria’s main reservoir is other cows with the infection, though it can live a short while in the environment e.g. slurry, foot trimming equipment etc.. Clearly it must spread from one cow to another somehow; via slurry, for example, is most likely. Carrier cows are those with the obvious lesions, but recent studies show that DD lesions regress and flare up, depending on the cow’s immunity and environmental factors. Cows with lesions which look like they have healed probably still carry the bacteria. Though those with active lesions probably shed the most into the environment. In this way, DD perhaps behaves a little bit like Staph aureus, the main contagious mastitis bacteria causing high cell counts. In this case, carrier cows exist, cell counts fluctuate, and shedding fluctuates too. Natural bacteriological cure rates are very low for both conditions viagra ordonnance belgique. DD bacteria won’t cause the disease unless the skin of the foot is first somehow damaged and the most usual way is by being wetted in slurry. Therefore slurry is more important in that it damages the skin rather than being the main reservoir of infection. But perhaps that’s academic: feet in slurry on farms where some cows have DD is likely to spell trouble. Yes, lower immunity spells bigger trouble. For example, dairy cows in early lactation naturally have lower immunity, which can be made worse by metabolic stress and concurrent disease, such as ketosis. These cows are more likely to have a flare up of active DD lesions. Biosecurity; don’t buy in cattle with DD. There are different DD strains so even if you have it on your farm, you don’t want to buy in further strains. Early detection and treatment: identify lame cows and treat all cases well (these are the main reservoir of infection). This is best done by lifting feet, cleaning off the lesion (dry cotton wool is best) and applying an appropriate topical treatment (i.e. directly onto the lesion). Severe cases may benefit from additional intramuscular antibiotic injections. It is a moot point whether an infected cow can actually be fully rid of the bacteria. Reduce slurry; keep feet dry; good hygiene. 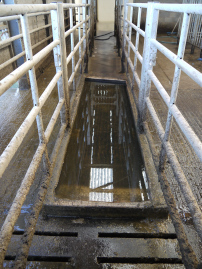 Pasture is good; slatted floors often help; good bed comfort so less time standing in slurry helps; wide passages and plenty of space all contribute to lowering the infection pressure and exposure to slurry. Notice I haven’t included foot bathing! That is not to say it isn’t important – done well it can be very valuable. However, it comes under the “good hygiene” bracket. By itself, foot bathing has limited benefit, though it will “dampen” infection pressure AS LONG AS IT IS DONE PROPERLY. In some scenarios, foot bathing can make DD worse in my experience: e.g. too many cows going through a dirty bath, or using parlour washings instead of an effective disinfectant such as Copper Sulphate, Glutaraldehyde or Formalin. Done badly, the effect of foot bathing is further skin damage due to wetting and this can lead to more DD.